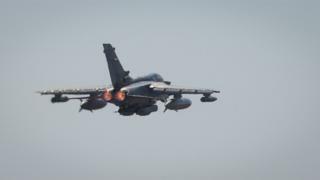 An RAF Tornado travelling at 517mph (832km/h) came within 22m (72ft) of hitting a drone, a report has revealed. The jet, which was flying in formation 10 miles (16km) north-east of Wattisham Airfield in Suffolk, did not see the remote-controlled aircraft, according to the Civil Aviation Authority (CAA). The drone pilot, which reported the incident, said there was a high risk of collision. The CAA Airprox board’s report said “safety had been much reduced”. The drone, which was carrying out an agricultural survey, was at an altitude of 100m (328ft) while the jet was at 121.9m (400ft) when the near-miss took place on 4 July. While the drone operator was not required to inform Wattisham Airfield of their plans, Air Command said they could have done so considering the proximity of the base. It praised the drone pilot for descending the aircraft once the Tornados had been detected. However, the report said that while the drone operator had reacted swiftly, the speed of the Tornado meant there was little that could have been done to avoid a crash. London Gatwick Airport was brought to a standstill last week when drones were sighted, while another Airprox report revealed a Boeing 737 came within 15m (50ft) of a drone while coming into land at Stansted in August.